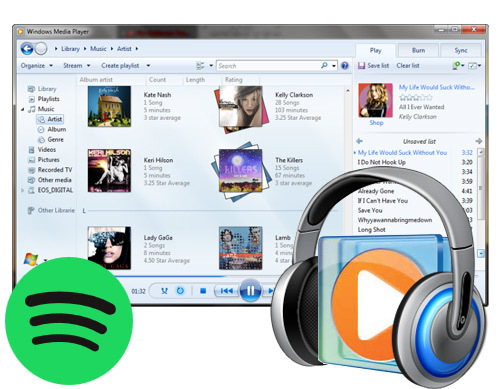 Windows Media Player (abbreviated WMP) is a well-known software developed by Microsoft that supports playback of audios, videos and pictures along with fast forward, reverse and variable playback speed. In addition to being a media player, Windows Media Player includes the ability to rip music from and copy music to compact discs, burn recordable discs in Audio CD format or as data discs with playlists such as an MP3 CD, synchronize content with a digital audio player (MP3 player) or other mobile devices, and enable users to purchase or rent music from a number of online music stores. We can say it is a powerful media player with multiple functions. But can we play Spotify songs on Windows Media Player? Most of people may say no. But here we are going to break it through in a quick and easy way with NoteBurner Spotify Music Converter. As we all know,Spotify, the undisputed king in the current market of streaming music, is DRM-protected, which prevents us streaming Spotify songs to other devices. Thus to play Spotify songs on Windows Media Player, the first thing we need to do is to remove its’ DRM. How can we make it? The best Spotify DRM removal tool, NoteBurner Spotify Music Converter, will show you the way. 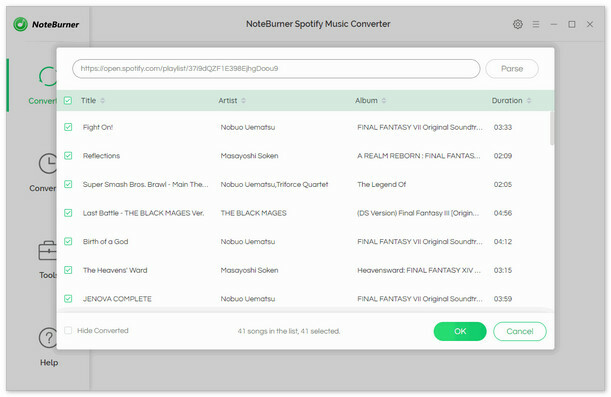 NoteBurner Spotify Music Converter is specially designed for removing the DRM from Spotify Music. It can convert Spotify songs to DRM-free formats including MP3, AAC, FLAC and WAV with 100% audio quality and ID tags kept. With NoteBurner Spotify Music Converter, you can simply play Spotify songs anywhere on any devices in any time. Now let’s start our journey to play Spotify songs on Windows Media Player. Click button "+" on the upper left, a pop-up window will show up and the next thing you should do is to directly drag the songs or playlists from Spotify here and then press icon "OK". 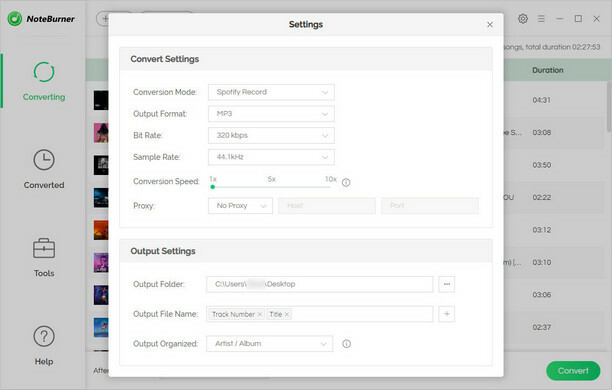 After customizing the output setting, click button "convert" to start removing the DRM from the Spotify songs we choose.There is a stripe that will show you the converting progress. When the conversion is done, all the Spotify songs we get are DRM-free files. 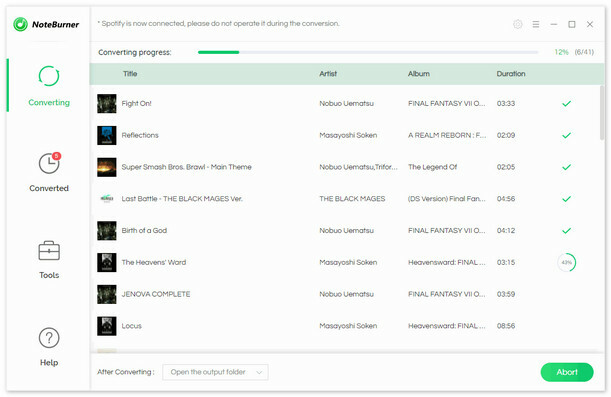 The output folder will be opened automaticly or you can also click the history button on the upper right corner to find them. Add the converted Spotify songs to Windows Media Player and now you can comfortably lying down, enjoy the familiar melody and relax your nerves. Note: The free trial version of NoteBurner Spotify Music Converter converts three minutes of each audio file only. If you want to unlock the time limitation, you can purchase the full version with $39.95.